Two very good friends invited my wife and I over this last weekend. 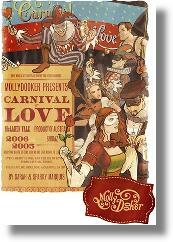 And, they suggested doing a two-year vertical tasting of the 2005 and 2006 Carnival of Love. Gads, can you think of anything better? All I could say was YES! We settled in with a delicious dry white, along with homemade pate, 8-year old cheddar, and some other goodies. Once our palates were cleared and ready, the Mollydooker bottles were uncorked. They were both blindly poured in separate glasses, but we were not told which was which. Starting with the 2006, the powerful nose suggested dark, ripe fruit. As it was tasted, the intensity of wine came through immediately and didn’t stop…continuing to a long, powerful finish. The flavors were those of dark fruit, blueberries, plumbs, and maybe a bit of raisin. Tannins were present, but so smooth that they blended into the experience as to be almost unnoticeable. Moving on to the second glass, the 2005, the nose really draws you in. Tasting, notes of smoke, spicy, licorice overlaying dark wild berries, with maybe a hint of coffee. Controlled tannins flow through the palette seamlessly. The silkiness of this wine is unbelievable as it rolls through your mouth. And, the finish goes on and on. Of the two wines, this smoothness…the incredible softness of the 2005 Carnival is probably the most striking contrast. It was almost a shame to drink them against one-another, really, as you will tend to choose a favorite. The 2006 was bold, strong, intense, bursting…Wow! While the 2005 was also very powerful, it came across as intensely smooth, refined, and polished…perfect! Both are simply fantastic wines. It made us wonder how much of an advantage the one-year of cellar aging made over the 2006. It would be interesting to try this again next year. Thanks for the info on Mollydooker. I’ve never heard of it until coming across your blog. We’re so Central Coast centric due to our radio show. And I can barely keep up with all the wine happening here in our own backyard!